The Super Sportsman entered the Lewis Leathers range in 1973 when it was decided to give the Sportsman a revamp. The body was lengthened by the addition of waistband, two side adjusters replaced with an elegant one piece panel. Coloured leathers were now highly popular and the Super Sportsman was available in a wide variety of colours and contrast stripes – this is still the case today. 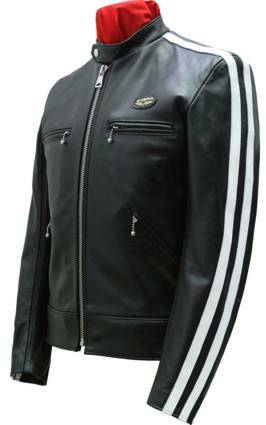 This jacket has trim sporty lines and is made in the popular single breasted style for wear on and off the bike. So comfortable you won’t want to take it off! Features include four convenient zipper pockets, zippered close fitting cuffs, a corduroy lined collar with a twin stud fixing and double waist adjuster for a snug draft free fit. Please note that larger sizes are available and are subject to surcharge of 30% for 46″ & 48″ and 40% for 50″ & 52″. Please email us using “Contact Us” option above for details of coloured leathers available for either the jacket itself or the stripes.